Here's one of the superb new new online slots game from Playson which you can play whenever you like. There is no need to reminisce about the humble fruit machine any more, thanks to the recent resurgence in their popularity among online slot developers! This vibrant and energetic slot by Playson encapsulates everything you love about this classic favourite but has revamped it with a jubilant carnival soundtrack and graphics that pop out from the screen. An explosive green background with coins flying out from it adds to the dynamism of the design. 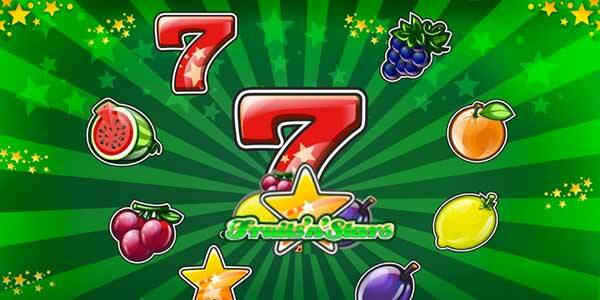 Reach for the stars and hit your 5 a day by having a spin of Fruits n Stars play video slots. Founded in 2010 and with offices in Malta and Ukraine, Playson aims to provide ‘unique gaming solutions’. They have built a strong portfolio of over 40 slots that have proven highly popular in the European market, and they are set to be biting at the heels of more experienced developers such as Eyecon. Playson have recently released a festive version of this slot – Fruits n Stars, Holiday Edition – so if you want to get into the Christmas spirit why not give it a go! If you’re looking for more fruity fun, they have a similarly juicy game called Fruitful Siesta which is worth a try. If you love promo's, get the best offers for slot games today. 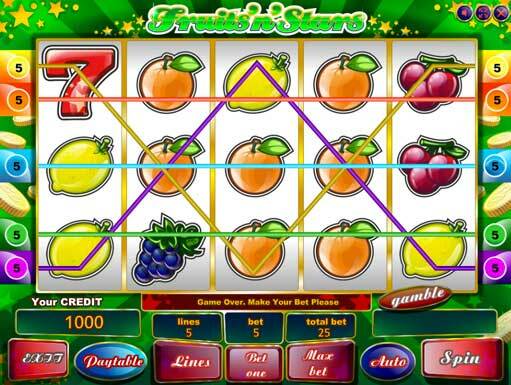 This is a 5 reel slot with only 5 possible paylines. However, you can bet up to a massive 200 coins per payline, meaning a total bet of up to 1000 coins per spin. The lowest scoring symbols are the cherries, lemons, oranges, and plums, but even with these humble fruits, lining up 5 of them will win you 200x your bet. Meanwhile lining up 5 watermelons or grapes will secure you 500x your stake. 7 is your lucky number, however – line up 5 of this symbol and you will be rewarded with 5000x your stake on that payline! That means there’s a maximum win of 1,000,000 credits if you placed the maximum of 200 coins on that line. The Golden Star is the scatter symbol in this game. Secure 3 of these shining stars anywhere on your screen and you’ll be rewarded with 2x your total bet across all paylines, 4 of them will give you 10x your total bet, and if you are lucky enough to get 5 you can expect to win 50x your total bet! The final feature to be aware of in this game is the Gamble feature. You can initiate this game by clicking Gamble after securing any winning combination. Up to 4x you have the chance to double your winnings by guessing correctly if the card to be turned over is red or black, but an incorrect guess will end the game and wipe your winnings. The simplicity of the game, as well as its cheerful backing music and bold cartoon graphics, is sure to put a smile on your face. There’s nothing to get too stressed about and so you can just sit back and have fun!